My rather clever friend Cath gave me the heads up on this book - I haven't even got my hands on a copy yet and am raving about it. It's entitled "Just Kids" and is written by Patti Smith. 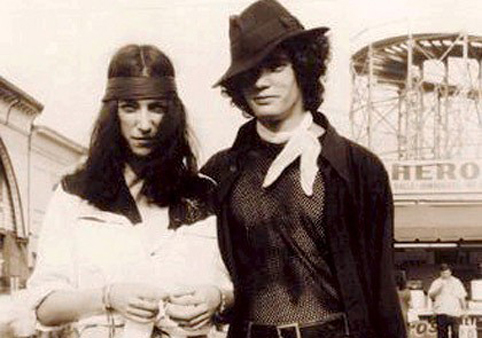 It gives her account of New York city in the 1960's as she explores it with her friend Robert Mapplethorpe. OMG how young and gorgeous were they both - I want to BE them! A description of the book as seen at Harper Collins. Doesn't it sound fab? "It was the summer Coltrane died, the summer of love and riots, and the summer when a chance encounter in Brooklyn led two young people on a path of art, devotion, and initiation. Just Kids begins as a love story and ends as an elegy. It serves as a salute to New York City during the late sixties and seventies and to its rich and poor, its hustlers and hellions. A true fable, it is a portrait of two young artists' ascent, a prelude to fame."